LOS ANGELES, CA--(Marketwired - Nov 6, 2013) - Do you feel the chill? It's time to get ready for the snow season. This year, Ski Dazzle® - The Los Angeles Ski Show & Snowboard Expo® is celebrating 50 years of offering incredible shopping bargains and money-saving specials to ski and snowboard enthusiasts. For four days only (December 5 -8, 2013), Ski Dazzle® will feature more than 250 exhibit booths showcasing ski and snowboard retailers and more than 50 local and national winter resorts. Located at the Los Angeles Convention Center-South Hall (1201 South Figueroa Street), attendees will have a chance to save hundreds of dollars on current and past season gear for adults and children. 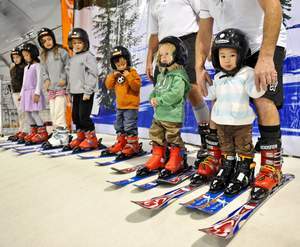 Show admission includes daily events such as continuous ski lessons on a 60 foot Snow Summit Ski School ramp; a new Riglet Park snowboard learning center for kids to 2-8 years old from Bear Mountain and Burton; a two-story high climbing wall; a 40x50 ice-skating rink, and cooking demos featuring Executive Chef Brett Lewis of the LA Convention Center. Back by popular demand is the high energy Bear Mountain vert ramp ready to thrill the Ski Dazzle® audience. The X-Games and World Cup Skate Tour emcee Dave Duncan brings world class skaters & BMX riders to the event, which include national and internationally ranked athletes. Debuting at Ski Dazzle is SkyTech Sport's Sochi Olympic virtual ski competitions. Attendees will have a chance to step onto an Olympic team training machine and into a virtual Sochi Olympic race course. The SkyTech Sport machine is featured all four days at the Ski Dazzle® show. Attendees can sign up for a free introductory lesson. In celebration of the 50th Anniversary of Ski Dazzle Los Angeles and the 60th Anniversary of Mammoth Mountain Resort, Mammoth will be offering show attendees a $60 lift ticket (one ticket per person, while supplies last). Also, check out the "Kids under 12 Ski Free" offer from June Mountain. These incredible lift tickets are only available for purchase inside the massive Mammoth Mountain Pavilion at the entrance to Ski Dazzle. For the first time at Ski Dazzle, six major ski resorts are offering a lift ticket bonus with the purchase of a general admission ticket. Participating resorts include: Brianhead, Bear Mountain, Mt Baldy, Mountain High, Snow Summit and Snow Valley. Admission Tickets: $20 for adults includes choice of a free lift ticket or free lesson package or a buy-one-get-one free ticket from a choice of six resorts -- up to $89.00 value (see website for details). Plus a $10 Liftopia.com gift card. $5 for children 6-12 and children six and under is free. Tickets are on sale now. Participating sponsors of the Ski Dazzle®- The Los Angeles Ski Show & Snowboard Expo® include Snow Summit, Bear Mountain, Liftopia, SnoCountry, AirStar Lighting, MakeAHero, OnTheSnow, Snow Magazine, KJAZZ, LA Weekly and LA Downtown News.